For the first time, the hidden secrets of Revelation are made clear and accessible to anyone. 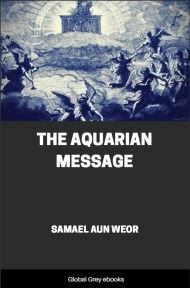 In The Aquarian Message, Samael Aun Weor shows how everything in Revelation and Christianity is based on Kabbalah (of which Jesus was a master), esoteric Christianity, alchemy, Tarot, and other ancient sciences. In this book you will discover that every symbol in Revelation is about you, your spiritual state, and the future it is taking you towards. Son of Man, reveal to us the hidden. Each delicious symphony of the ineffable cosmos, each note, each tender melody hidden within the very pure enchantment of the exquisite fragrant roses of the gardens of Nirvana is the living incarnation of the Word. Listen you men and Gods: Within the mystery of each profound wave, the adorable One is at hand.. .He who makes us kings and priests unto God and his Father. At times, the morning breeze brings us sweet melodies like the murmur of a mother, yet other times so severe like the lightning that terribly flashes within the catastrophic tempest of the furious apocalyptic ocean. A terrible lightning flashes within the blue velvet of the starry night... He is the Son of Man! The Intimate emanates from this divine ray. The choir of the Saints resounds and tenderly the Virgins of Nirvana sing. These Virgins are deeply moved when this Ray penetrates the soul of a Holy Man. The ineffable ray (Christ) penetrates the soul and transforms into Her. He transforms himself into Her and she (the soul) transforms herself into Him. The Divine becomes human and the human becomes divine. These are the eternal weddings of the soul with the Pascal Lamb. That which we call the Son of Man is the result of these alchemical weddings, of this mixture of Love and Peace. He is the resplendent and luminous “I AM”, our resplendent Dragon ofWisdom. He is the richest treasure which the Adorable One has brought to us. He is the Man-Sun, Ormus, Osiris, Vishnu, Chur, the Lamb; also the Man of Time and of the River sung by Daniel, the prophet. He is the Alpha and the Omega, the first and the last, which is, which was and which is to come. He is the Eternal Beloved, the Elder of Days. The Lord of all adoration wants to dwell within the depths of each soul. He is the oil of the myrrh and the fragrance of the incense, HE IS the Adorable One and the Adorer. The phrase “I am” must be translated as “I am the Being”. In reality, the Beloved One is the Being of our Being that is, was, and is to come. We possess a precious tabernacle (the physical body), an anguished soul, and a Spirit (the Intimate). This human triad emanated from that terribly Divine Ray (Christ) who strikes His bell in the infinite space when we come into the world. Whosoever knows, the word gives power to. No one has uttered it, no one will utter it, except the one who has incarnated it (the Word, the Christ). The guests participate at the banquet feast of the Pascal Lamb. Those who have incarnated him shine with glory at the table of the angels. The countenance of the Beloved One is like lightning. Christ is the Army of the Voice. Christ is the Verb. The personality does not exist within the world of the eternal Beloved One, neither the individuality, nor the “I”. We all are one within the Lord of supreme adoration. When the Beloved one becomes transformed into the soul, and when the soul becomes transformed into the Beloved One, that which we call The Son of Man is born from this Ineffable Divine and human mixture. The Great Lord of Light, being the Son of the living God, becomes the Son of Man, when he transform himself into the human soul. The Sun-Man is the result of all our purifications and bitterness. The Sun-Man is divine and human. The Son of Man is the final result of the man (human being). He is the child of our sufferings, the solemn mystery of the transubstantiation. Christ is the Solar Logos (Multiple Perfect Unity). Christ is the Eternal Great Breath, profound, immeasurable which emanates from the ineffable bosom of the Absolute. Christ is our Eternal Incessant Breath, profoundly unknown to himself. He is our divine Augoides. Christ is the purest, ineffable and terribly divine Ray that shone as lightning on the face of Moses, there.. .within the solemn mystery of Mount Nebo. Christ is not the Monad. 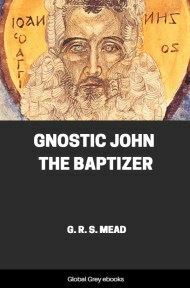 Christ is not the Theosophical septenary. Christ is not the Jivan-Atman. Christ is the ray that unites us to the Absolute. Christ is the Central Sun. Christ is Kwan Yin (the ineffable voice) in the east, who is the same Avalokitshvara, as well as Vishnu. Christ is Osiris among the Egyptians, and whosoever incarnated him was an Osirified One. 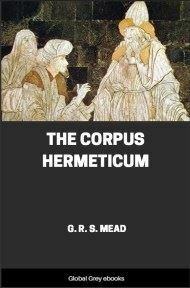 Christ is the Atmic Thread among the Hindustani. The Son of Man shines with all the strength of his glory in the solemn banquet of the pascal Lamb.